– Antibacterial Australian body care tea tree lotion will be applied following your waxing treatment. It is advised that no other body lotion, creams, Self tans etc. Are applied for 48hrs. – Antibacterial soothing aloe gel is applied following epilation treatment, it is advised that no other lotion or cream is applied for 48hrs. – After 48hrs, regular exfoliation is advised (2x week) to reduce the risk of ingrown hairs. Ancient Indian method of hair removal, excellent for skin too sensitive to wax or for precision finish eyebrows. Lash Extensions are Thee go to treatment right now. Whatever the occasion, special event, holiday or just lashes for life, we have many treatment options to suit all needs and budgets. Which lashes are right for me? Celeb style lashes, uber natural, glamorous and questionally yours? Volume lashes every time. Want Full & Fabulous lashes without the weight of classic extensions?. We get it. The latest revolution in lash extensions, our volume lashes are applied in hand made fans of multiple lengths creating full on fluffy, wispy gorgeousness. Let your eyes do the talking as we customise your lashes to express your unique style. Ultra light, super comfortable, simply fabulash! wake? Extend makes it happen. Extend lash extensions are soft but strong, the effect is flawless with this single lash to lash extension treatment. A natural lash treatment to give length, volume & Lift to your own lashes, no extensions needed. Lasts 6-8 weeks. Treatment Includes recommended Dream lash conditioning serum. – Take care with nail paint for up to 1hr following treatment – Open toed sandals should be worn following pedicure treatment – Gloves should be worn when doing dishes/household work – Follow good homecare maintenance routine. Please ask your skin care therapist for advice. An inspired system born of the sea where Marine botanicals & Sea Salts energise and Quartz crystals & menthol cool. Includes marine spa bath & salt scrub, hydrating botanical oil massage & cooling menthol masque. Completed with Cuticle maintenance & nail file & polish Feet Reborn. Spirit satisfied. Clear, colour or French gel applied to the nail giving semi-permanent non-chip colour for up to 3 weeks. This treatment gives your nails extra strength without extra length, allowing your own nails to grow underneath. 1. Sculptures & overlays must be maintained every 2-3 weeks. 2. Cuticle oil and hand cream is recommended daily 3. Do not use nails as tools 4. Improper removal, picking, biting etc. WILL CAUSE NAIL DAMAGE. Should your nails need repaired or removed please make an appointment with your Bio-Sculpture nail technician. The original poli-gel, goes on like polish, wears like gel! Lasts up to 14days. This indulgent signiture treatment facial begins with a relaxing back massage & thermal touch foot treatment to relieve stress and tension. Followed by a prescriptive facial to include skin cleanse, exfoliation, soothing massage & customised mask application. Pure bliss..
Our Face Mapping ® skin analysis takes all the guesswork out of getting results. Your Dermalogica Skin Therapist will diagnose your skin’s concerns and prescribe a no-nonsense home care and treatment regimen to deliver your optimum skin health in your 14 unique zones. A professional consultation that reveals your skin’s past, present… and healthiest future. Test-drive your prescribed regimen under the guidance of a professional Skin Therapist. At Skin Bar®, you can learn about your skin with Face Mapping®, and then learn how to use the products, hands-on. Medically approved permanent hair removal. Free consultaion without obligation. * Home visits and wedding packages available, please ask for details. – Allow product to stay on your skin for a minimum of 4 hrs following your treatment for maximum absorption. – Drink plenty of water; the recommended daily amount is 2ltrs. – Avoid carbonated drinks, caffeine and stimulants such as nicotine and alcohol. – All products are available for retail purchase. An indulgent all over body treatment relieving Stiffness and tension, targeting problem cellulite, Blemished or ageing skin, restoring balance to Mind and body and revitalising the senses. Using specially blended aromatherapy oils, this treatment massage works to improve the tone and elasticity of the face and décolleté whilst relieving tension in the neck and shoulders. A perfect add on relaxer with reflexology or a Hot Paraffin Pedicure. Concentrating on areas of stress and tension to relieve and restore where you need it most. 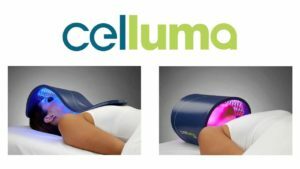 The Multi Award winning & FDA approved CELLUMA PRO LED light therapy is a revelation in the treatment of skin aging, acne, wound healing & pain management. A blend of Blue, Red & infrared light penetrate deep into the dermal layer of the skin, stimulating cellular renewal, healing, collagen & elastin production restoring fullness and volume to skin texture. LED light therapy also reinforces skins structure, improving skin tone and clarity in this non-invasive therapeutic treatment. 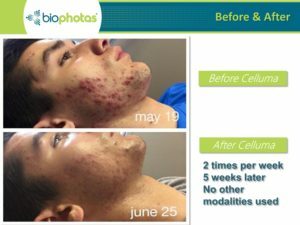 Included in all our Pro skin treatments and peels, CELLUMA can also be applied as a stand alone therapy or as an add on to any massage therapy for pain management. Q. What is LED light therapy? Q. How long does it take to work? A. Most people feel, or see an improvement with 1-2 uses. A course of 8-12 is recommended. Q. But does it really work? A. YES! The technology embedded in Celluma was developed by NASA. 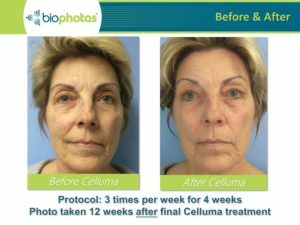 Celluma is a clinically proven device with FDA clearance in the treatment of Wrinkles, acne, pain management & dermal wound healing. Q. Will I feel anything? A. 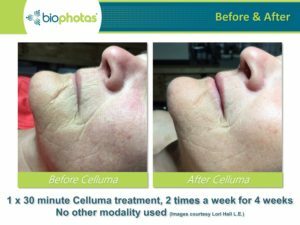 No, there is little or no sensation, Celluma helps tissue heal naturally from the inside out in a non-invasive way .